I started out back in the 70’s as a “hot-shot” young reporter working on local weekly newspapers and eventually the Cambridge Evening News. In 1980 I went to Africa to report on Zimbabwe’s independence, and while there, someone challenged me to take a closer look at the claims of Christianity. I’ve been reporting the good news about Jesus ever since! News is neutral. Whether it’s good or bad depends on your circumstances. A glass of cool fresh water is good news to a man lost in a desert. Not such good news to a man drowning in the sea. What struck me when I took a closer look at the news of Jesus was that it was good news whatever your circumstances. Let me make something clear before I go any further – I am a believer in God and not in the least bit ashamed to admit it and declare it. Following Jesus has enriched and transformed my life beyond measure. I’ve listened carefully to all the counter arguments of modern science and philosophy and come to the conclusion that either way you need faith. Questions about the existence of God and the origin of life and the universe cannot be answered beyond doubt by physical evidence alone. Yes there is evidence, but we have to interpret it by faith. That being the case, I find it easier and infinitely more satisfying and rewarding to put my faith in God. When I look at the magnificence of creation, the phenomenal intricacies – or as Stephen Hawking puts it the “fine tuning” – of the universe that has led to such perfect conditions for life and the sustaining of life, my heart and my head tell me there has to be someone behind it. Can such beauty and brilliance have come about by random chance? I’d rather believe I’m living in a world that was lovingly created than in a cold and accidental universe devoid of intent and purpose. I like to believe there is a reason! For me, the question is not whether there is a God, but what is He like? Is He interested in our lives? Does He love us or care for us? Can we get to know Him, to speak to Him? And with so many different viewpoints about what God is like - who is right? Never mind us trying to contact God, has God tried to contact us? The simple answer to all of the above is yes God loves us, He cares deeply for us and wants us to know Him, not just know about Him. And He didn’t leave all this to speculation and guesswork – He came to us in the person of Jesus, to openly declare and demonstrate His love for us, to show us what He is like and to make it possible for us to know Him. As I said at the beginning, news is neutral and can be good or bad depending on your circumstances. But the news about Jesus is always good and good for every person. It is good news that the God who created the universe and created humanity in His image, loves us unconditionally and cares deeply about both our temporal and eternal well-being. It is good news that we can experience true peace, hope and happiness through friendship with God regardless of what’s happening around us. You see, humanity lost its way when we turned away from the knowledge of God and decided to go it alone. To put it bluntly, trusting ourselves doesn’t reap the same reward as trusting in God. The mess we see in the world today is not God’s fault but the result of us all going our own way. The good news is that every one of us has the opportunity to turn back to God by choosing to believe and trust in Jesus. It is good news that the things we all desire most in life, the things money simply cannot buy – peace, hope, happiness, forgiveness, love, acceptance, purpose and identity – are freely available to us through Jesus. The peace Jesus offers is not a mere cessation of hostilities, but an inner tranquillity and assurance, even though storms may rage around us. The hope Jesus offers is not a wishy-washy “maybe” if all goes well kind of hope, but the certainty that God is with me, that there is a purpose and destiny for my life, and the assurance that I have the gift of eternal life, even beyond the grave, because Jesus died on the cross for me and rose from the dead for me. And the joy Jesus offers is not a circumstantial joy based on whether my team wins or I pass my exams or I survive cancer – but an inner joy that governs my attitude to the world around me rather than circumstances dictating to me. And the best news of all is that all of this is free! There’s no long list of do’s and don’ts, no rituals and sacrifices, no fear of failing, no fear of rejection. God has made all this possible for us in Jesus – and He asks only that we turn to Him, talk to Him, trust in Him. If you want to know more, get hold of a Bible, read the New Testament, and in particular the Gospels and simply talk to God as you would to a friend, ask Him for yourself to show you what He is really like, ask Him about your life and about His love for you. As a reporter all those years ago, I knew a “good” story when I heard one, and the story of Jesus was the best news I’d ever heard. From the moment I opened my heart to His message, I was overwhelmed with a sense of “home-coming”. To experience, first-hand, the love of God in your life, is more than just good news, it is life-affirming and life-transforming. 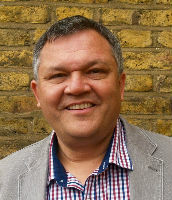 It has been my privilege to be “reporting” the good news of Jesus right here in Haringey for the past 27 years and if you would like to know more or ask further questions about what the good news of Jesus could mean for you – please feel free to get in touch!